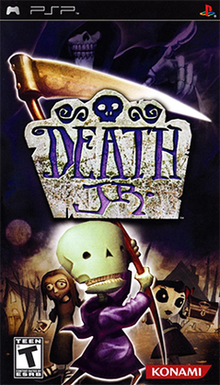 Death Jr. is a video game for the PlayStation Portable. The PSP iteration was the first PSP game shown publicly and advertised as a killer-app. It was released to a mixed reception and noted for numerous problems about the camera, gameplay and uninspiring graphics, but was praised for its Tim Burton-esque themes and quirky characters. Slightly better received was the comic book adaptation by Gary Whitta and Ted Naifeh, which includes two three-issue miniseries. The game and comic book are about the teenage son of the Grim Reaper, named Death Jr. (DJ for short). His father tried many times (all of them failed) to stop his son from creating chaos at every school he has been in. Now is DJ's last chance. If he creates chaos one more time, he'll be sent to military school. He meets new friends at this school: Pandora, a girl with Obsessive-Compulsive Disorder and a thing for locked boxes; Stigmartha, a girl who has holes in her hands and bleeds from them whenever she's nervous; Smith and Weston, conjoined twins who are very smart and conjoined at the head; the Seep, an armless, legless, foul-mouthed kid in a vat; and the Dead Guppy, a character who speaks for himself. The friends go on a field trip to a museum, where they find a locked box that Pandora wants opened, so DJ opens it to impress her. Unfortunately, all hell breaks loose and demons run amok. It's up to DJ to stop them and revert the town back to normal, all the while making sure Dad doesn't find out. The game received average or mixed reviews, as GameRankings gave it a score of 63.30% while Metacritic gave it a score of 61 out of 100. ^ a b "Death Jr. for PSP". GameRankings. Retrieved 2014-01-08. ^ a b "Death Jr. Critic Reviews for PSP". Metacritic. Retrieved 2014-01-08. ^ Nutt, Christian (2005-08-16). "Death Jr". 1UP.com. Archived from the original on 2014-01-08. Retrieved 2014-09-14. ^ Edge Staff (November 2005). "Death Jr". Edge (155): 113. ^ EGM Staff (September 2005). "Death Jr". Electronic Gaming Monthly (195): 116. ^ "Death Jr". Game Informer (149): 115. September 2005. ^ Ouroboros (2005-08-17). "Death Jr. Review for PSP on GamePro.com". GamePro. Archived from the original on 2006-01-04. Retrieved 2014-01-08. ^ Reilly, Mike (2005-08-31). "Death Jr. Review". Game Revolution. Retrieved 2014-01-08. ^ Navarro, Alex (2005-08-16). "Death Jr. Review". GameSpot. Archived from the original on 2007-02-07. Retrieved 2014-01-22. ^ "Death Jr., Review". GameTrailers. August 26, 2005. Retrieved 2014-01-08. ^ Nix, Marc (2005-08-12). "Death Jr". IGN. Retrieved 2014-01-08. ^ OPM Staff (September 2005). "Death Jr". Official U.S. PlayStation Magazine: 93. Archived from the original on 2014-01-08. Retrieved 2014-01-08. ^ Hruschak, PJ (2005-09-21). "Death Jr". CiN Weekly. Archived from the original on 2005-12-01. Retrieved 2014-01-08. ^ Schaefer, Jim (2005-09-04). "THAT LITTLE DEVIL: In 'Death Jr.,' the Grim Reaper's boy must undo the trouble his mischief caused". Detroit Free Press. Archived from the original on 2005-09-17. Retrieved 2014-01-08.